There was a application from Apple called Jar Bundler which got distributed by Apple with Xcode in the past. but you cannot get Jar Bundler. But there isn't any Jar Bundler. Even a global search sudo find / -name Jar\ Bundler.app did not really find Jar Bundler. Note: I know there are other ways to achieve what Jar Bundler is doing here, like for example using Mac OS X JarBundler ANT Task or build the whole application package by hand, but thats not the question. So looks like I have to answer the question my self. So don't punch me for that. After intensive research and downloading all Java Developer Packages from Apple since 2012 til now (March 2013) it turns out its has nothing to do wit Xcode. directory gets removed by the installation of this package, but there are no new /usr/share/java/Tools/*.apps re-installed anymore by the same package. Even re-installation of 2012-005 after /usr/share/java/Tools directory got removed by 2012-006 doesn't bring you back the Jar Bundler.app. Get Pacifist or some other tool of your choice who can deal wit *.pkg files. Open Java for OS X 2012-005 Developer Package with it. Thats it and don't forget to back it up. The official replacement for JarBundler is the javapackager tool. As an example of its use, a simple, well explained, step by step tutorial for making OSX apps from a java source is here: http://centerkey.com/mac/java/ . In short, if you want Jar Bundler, install "OS X 2012-005 Developer Package". More recent packages have it removed. Jar Bundler is retired now and will not work for projects requiring Java 7 and up. Check this other StackOverflow question «Bundle a Java 7 .jar for Mac» for more details. The solutions mentioned in this question will in all likelihood continue to function, but only for projects up to Java 6. As a developer with Pyxis Software, I would like to add that we have developed a small inexpensive application called Pyxis Bundler that makes it really easy to create Mac application bundles. We designed it as a replacement for the Jar Bundler application that was previously shipped with Xcode. Then simply enter your application name, version number, ram requirements, your package name, main class name, and a few other items. Next click Create and that's it, your application is bundled into a standard Mac Bundle. Note that any Application created is saved to a preferences file. What this means is that bundling updates is simply a matter of choosing your application name from a drop-down list and incrementing the version number and then clicking the Create button. Make an alias: alias javapackager="/Library/Java/JavaVirtualMachines/jdk-9.x.x.jdk/Contents/Home/bin/javapackager"
Now you have to go inside this folder: Packages. You'll find JavaEssential.pkg and JavaTools. Jar bundler is in JavaTools.pkg. Not the answer you're looking for? Browse other questions tagged java macos bundle jarbundler or ask your own question. Convert .jar to an OSX executable? How to distribute Java application 7.0 and above on Mac 10 and above? 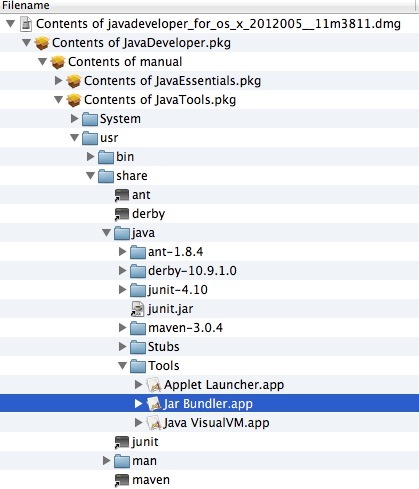 How to run JavaFX jar with JRE7 on MAC OS Lion 10.7.5? Why is it that Silverlight 5 not work consistently well on Mac OS X 10.8.2? Can OS X applications linked against JavaVM Framework run with Oracle's JRE 1.7?